First, plea bargains are different than trials. Ramirez received a three-year sentence as part of a negotiated plea deal between his attorney and the prosecutor, so Judge Persky had no discretion to give him a lesser sentence. As the California Supreme Court has explained, in a plea bargain, a “defendant agrees to plead guilty in order to obtain a reciprocal benefit, generally consisting of a less severe punishment[. ]” This results from “a process of ‘bargaining’ between the adverse parties to the case — the People represented by the prosecutor on one side, the defendant represented by his counsel on the other — which bargaining results in an agreement between them.” The judge “has no authority to substitute itself as the representative of the People in the negotiation process.” Nor does the judge have any role in deciding what charges are filed in the first place. Last year, the California legislature adopted this view by passing a law that makes consideration of adverse immigration consequences a mandatory part of plea negotiations. Immigration reform activists hailed California for “bold steps [that] should serve as a roadmap.” We should be wary of distorting the results of the state’s prudent and humane immigration policy to suggest that the criminal justice system coddles defendants. 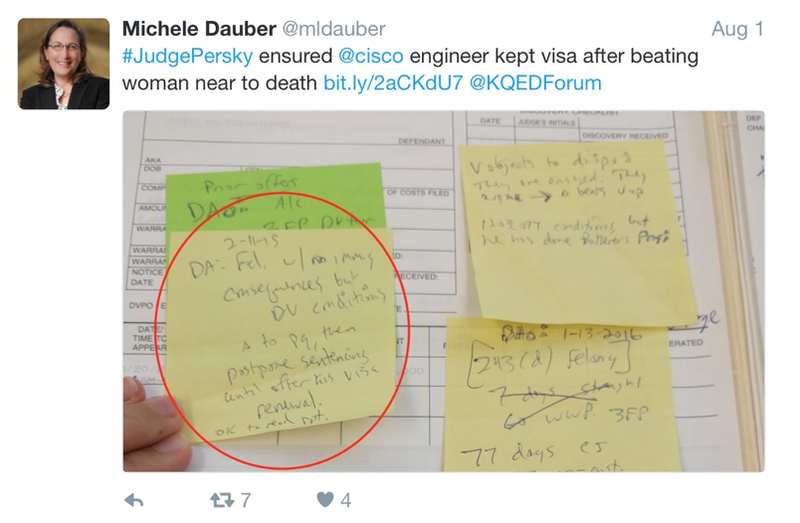 And attempts to use plea-bargained sentences or prosecutorial charging decisions as a way to smear Judge Persky should be dismissed out of hand.